When people talk about going to the beach in Dar es Salaam, very often they mean heading out to Mbezi. I like hanging out in Mbezi, I really do, but sometimes I am in the mood for something a little more serene, far from the crowded, noisy beaches that are the norm in Mbezi, especially over the weekend. When I am in this mood, I head out a little further north to Kunduchi beach, more specifically, I head out to Kunduchi Beach Hotel. There, especially if it is low tide, I walk down a particular patch of sand that seems like a road leading deep into the ocean. At the end of this road is a point where sand meets ocean meets sky (with the hotel itself far, far behind me). I’ve recently decided that this is my spot. You know that place where you go to clear your mind and get an instant mood lift? Yes, it’s definitely my spot. I could try to describe my spot more to you but probably wouldn’t be able to do it justice. Instead, since a picture is worth a thousand words, here are a few pictures from the last evening walk I took there. Sorry, Slide.com shut down recently so this slideshow no longer exists. But…enough about my spot. Let’s talk a bit about the hotel itself. I first (re)discovered Kunduchi Beach Hotel on a random Monday in December 2007, when a girlfriend invited me to spend the day at the beach playing hooky with her and her sister. 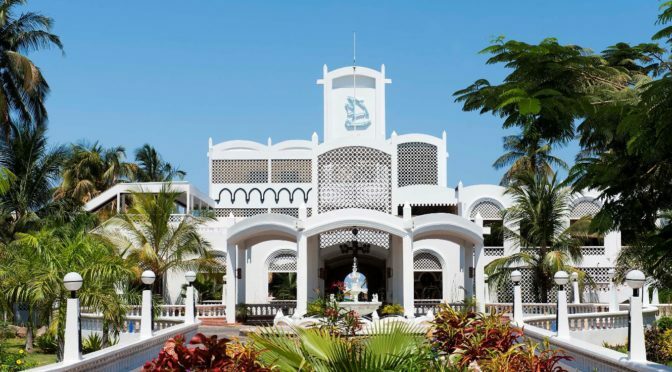 I say rediscovered because I’ve always known of Kunduchi Beach Hotel; the original hotel was first opened in 1971 and was a regular haunt of my parents during my earliest years. Sometime in the ’90s (or thereabouts), Kunduchi Beach Hotel faced serious beach erosion that was so severe that it even affected the hotel’s foundation. Eventually, the hotel closed down, was sold off to private investors, and didn’t reopen again until March 2005, after having undergone extensive renovation and land being reclaimed back from the ocean. That Monday was my first visit to the hotel since 1991. The first thing that struck me was the visual appeal of the hotel. 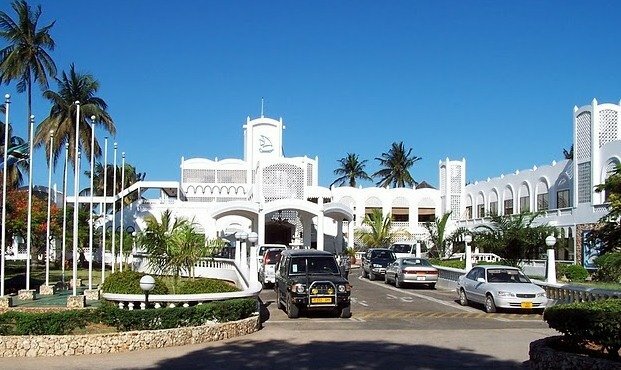 From the stone-finished parking lot to the grandiose front façade, the new Kunduchi Beach Hotel was a lot nicer than anything I’d expected it to be. I liked the reception area with its fountain and Swahili-style colorful seats. The Louis XIV furniture in the lounge area, which might seem over the top to some, worked well in my opinion, especially in contrast to the pristine beach which can be seen from as far as the hotel’s entrance. As you can tell, I still vividly remember that first visit today: it was a visual barrage that had me smiling inside. My friends and I decided to settle down at a table in the sandy area closest to the ocean. We were a distance away from the main bar and restaurant and it took us forever to get service. Once we were finally attended to (despite the fact that there was almost no one else there) the service was horrible. I hate to break it to you, but service is not one of Kunduchi Beach Hotel’s strong points! Anyhow, we had a good day at the beach that day, despite the bad service and bad food. Oops, need I break another one to you? The food at Kunduchi Beach Hotel is nothing to write home about. It’s passable at best! Still, I’ve found myself going back to the hotel again and again, especially since the renovation of the boat-inspired S.S. Mawimbi Bar (which I love). Notice I’ve said nothing about the hotel’s rooms. That’s because I haven’t stayed at Kunduchi Beach Hotel since its reopening. Still, I once got a chance to look at some of the rooms when I accompanied someone who was planning a surprise Valentine’s Day getaway for her and her husband. Frankly, I can do a room with a Jacuzzi (complete with in-built radio) on a balcony overlooking the Indian Ocean any day!!! I don’t know about you, but for this reason alone, I look forward to one day staying at Kunduchi Beach Hotel (despite the many negative online reviews I’ve read about accommodation there). All in all, I enjoy hanging out at Kunduchi Beach Hotel. If you’ve never been, I recommend that you check it out. If you have, what are you thoughts on the hotel? Like it? Don’t? As always, I look forward to hearing what you have to say. Thanks for your comment. Come visit and I’ll make it my business to take you there personally. 🙂 Thanks for the kudos on the slide show. I’ve wanted to visit Kunduchi for a while since I was in Dar. Don’t I need a boat to get there? It looks fantabulous and too attractive at a glance, congratulations for such creative ideas and for adding value to the tourism industry. Kelvin from Kenya. @JamesBrett – You’re right: I think you do know my place. I never thought to swim out to the next sandbar, though I did think it’d be interesting to take a canoe across. 🙂 If you’ve swam it before, how long did it take you to reach it? Was it an easy swim? And…how was your trip to Dar? @Ken – Hi, Ken. Welcome to ChickAboutTown! No, you don’t need a boat to get to Kunduchi – it’s right off Bagamoyo Road. Have you been yet? to reach the next sandbar only takes 2 or 3 minutes of swimming. it’s not far at all. but if you take a kayak (or canoe), you can make it all the way to the island out there (mbudya?) in about 30 minutes or so. there’s great snorkeling out there, and guys catch seafood and cook it for you on the beach. Wow, your trip sounds like it was a lot of fun! I love Zanzibar. I need to make a plan to go there again sometime soon!